Way back when I posted the recipe for Chocolate Yogurt Supreme, y’all got very excited. I got lots of notes asking me to make a whole range of yogurts, to spice – as it were – your breakfasts and desserts up. It’s been a while. Sorry about that. So, maybe, just maybe, even if you don’t like lemon, you’ll want to try this. If you like lemon, and you’re a busy person, I suggest making a big old batch of this for the week, so you only have to do all the mixin’s once. Stash in an airtight container in the ‘fridge and you’re good to go for breakfasts or desserts for days. Hurrah! PS. No, I don’t eat my yogurt in a cute little porcelain cup and saucer with a Greek yogurt and lemon zest garnish on a pretty napkin. I sling it in a glass lidded Pyrex dish and schlep it to the office. But on high days and holidays you can totally turn this into a fabulous dinner party dessert or special breakfast-in-bed treat in under a minute. We love that! Matilda, one of our lovely readers from Australia, has a friend with a lemon tree. I wish I had a friend with a lemon tree, because I have a suspicion that there is an awful lot of SANE Lemon Curd and Lemon Yogurt Supreme in my future. 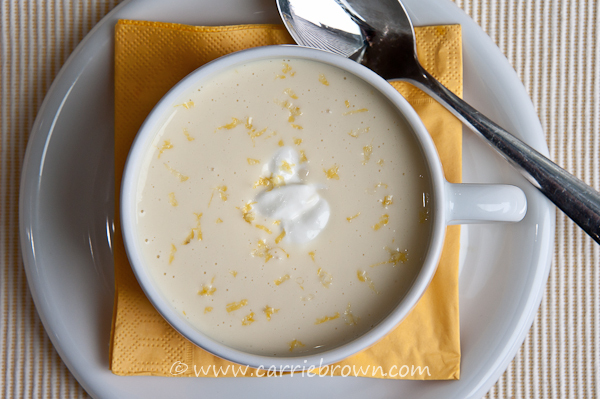 Stir the yogurt and lemon curd together in a bowl until completely mixed. Add the protein powder and salt and mix well until the protein powder is completely dispersed, and the yogurt is smooth and lump-free. l love your recipes, this an immediate must try! is there a list of sane foods? yogurt is part of it? I’ve heard so many mixed ideas on dairy…please help! I’m not an egg person so yogurt is huge since not much left to eat for the mornings…definitely lost. Would appreciate the help. Thanks.